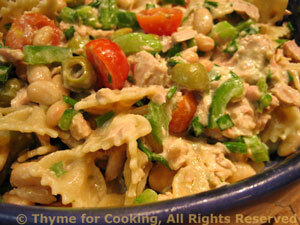 Easy Dinner from Thyme for Cooking: Tuna and White Bean Pasta Salad. Tuna Macaroni Salad was a summer staple when I was a child. I don't know if it still is.... This is an updated version: more veg, no mayonnaise.